← What’s on this December? Buy a Photography Course Voucher as a Christmas Gift! If you’ve not already decided on your Christmas presents, or if you’d like to give a special person something more, why not give your partner, best friend, or relation a Photography Workshop Gift Voucher for Christmas……..or ask someone to buy you a much deserved gift! Not only that; if you book before Midnight on Saturday 22nd December you’ll get 10% off any booking. Simply put Christmas 2018 into the Discount Coupon Box at Checkout. If it’s a higher value workshop and you’re simply pay a deposit at this stage, you’ll get the 10% discount off the balance as well of course! 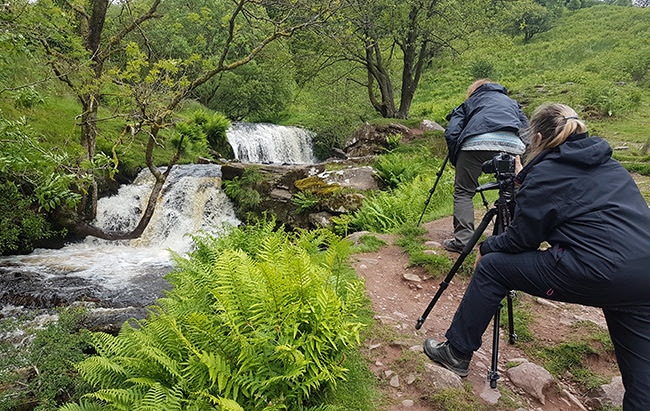 Give them something to look forward to in the New Year with the flexibility of any course or workshop of their choice from a One Day Experience in the Brecon Beacons, other locations in Wales or Shropshire to Four Days on the Isle of Skye, Northumberland and more. They’ll enjoy a trip away in a glorious part of the UK as well as developing their photography skills beyond recognition! Workshops are for between 3-6 people and run all year round on set dates. You can buy a gift voucher for a specific date or an open one (valid for a year) which can be used for any workshop up to the stated length. Even if you buy a Gift Voucher for one workshop you can transfer it to another to the same value or put it against the cost of other of greater value so they are totally flexible! See our great choice of One Day Group Workshop Gift Vouchers here…..and see our equally great range of Weekend and Short Break Workshop Gift Vouchers here! Courses are for One Person or Two Booking Together and run year round on any mutually convenient date. They are therefore totally flexible and tailored to individual requirements. Again, vouchers are valid for one year; however any Individual Voucher not used within a year is valid for a further year on a Group Workshop up to the same value. Vouchers are available for my complete range of Individual and Group workshops and are valid for one year from date of purchase. You’ll frecvied a high quality laninted Gift Voucher together with a greetings card so it makes a proper present! If you prefer to use our original website www.creativephotographywales.com all information is still on there and you can book as normal. However this website does not have a discount code facility (it’s old!) and it does not have the Booking for 2 Discount, but don’t worry, you’ll be remimbursed the value of this after booking. Call Nigel on 01874 676402 or email your reply to this newsletter if you’d like any further general information or on a specific workshop. Detailed information on each workshop will be forwarded to you on booking. (payment required to confirm your place via Paypal or BACS).